5th August, 2016 as compared to 32.95 Lakh taxpayers last year till 7th September 2015. Of these Aadhar based E- verification was used by 17.68 lakh taxpayers during the current year as against 10.41 lakh taxpayers during the same period in 2015-16. In addition to these, 3.32 Lakh returns were digitally signed. 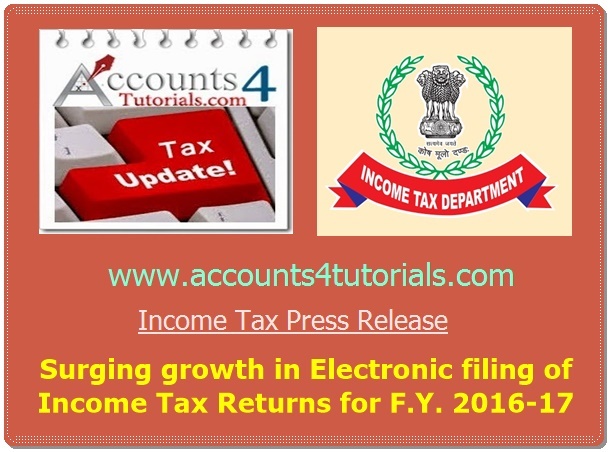 Thus, over 35% of taxpayers have already completed the entire process of Return submission electronically. The Department encourages all taxpayers who have submitted their ITRs to use the e-verification as an easy alternative to sending their ITR-V form to CPC, Bengaluru. Bangalore last year. Keeping the same momentum, the CPC Bengaluru has already issued over 54.35 Lakh refunds totaling to Rs 14,332 Cr which includes 20.81 Lakh refunds for AY 2016-17 (current year returns) totaling to Rs 2,922 Cr till 5th August 2016. The Department is committed to cSontinuous improvement of taxpayer services and seeks the cooperation of all taxpayers in contributing their fair share of taxes voluntarily.